Automatic voter registration isn’t the sexiest way to start a political revolution, but it may be the most effective. The United States lags behind the rest of the rich world in turnout, but it leads the rich world in disparity in turnout across income and education levels, which has profound effects on policy. This so-called "turnout skew" further biases policy towards the rich, even more than it already would be because of the structural advantages the rich enjoy. Bolstering turnout could lead to a self-reinforcing feedback loop in the opposite direction. As I’ve shown, turnout in the United States is dramatically skewed by class, race and age, in both midterm and presidential elections. The class divides in U.S. turnout are dramatic when compared with other countries (see chart). These divides lead to turnout that is overwhelmingly anti-redistribution, and biases the political system toward policies that favor the wealthy. As I’ve noted, among 18- to 24-year-olds earning less than $30,000, turnout was 12 percent in 2014, but among those earning more than $150,000 and older than 65, the turnout rate was five times higher, at 65 percent. 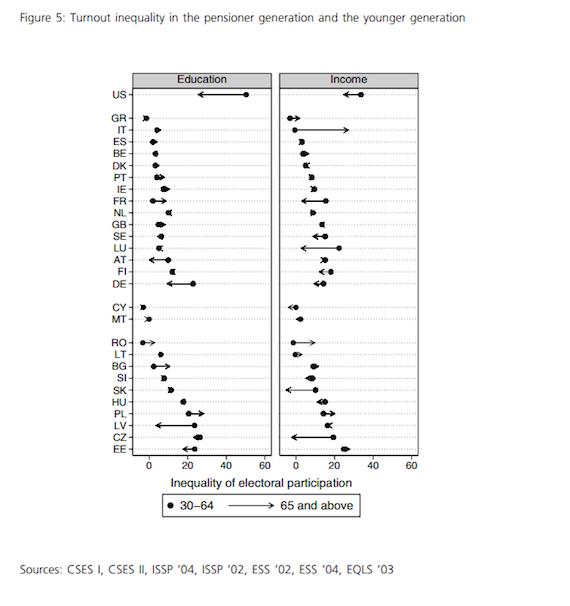 My work also shows that the people who are less likely to vote -- young people, low-income people and people of color -- are more favorable to a redistributive agenda. The impacts of skewed turnout are dramatic. The question about turnout is often framed about winning elections, and so is much of the political science literature. But as I’ve argued, the question should be how turnout affects policy, not electoral outcomes. A new metastudy finds that higher voter turnout bolsters progressive policy, though not always left-leaning parties. The author, political scientist William C. Terry, writes that while “most studies find no correlation between turnout and leftist vote shares,” the literature “suggests that structural turnout rates do affect policy outcomes. 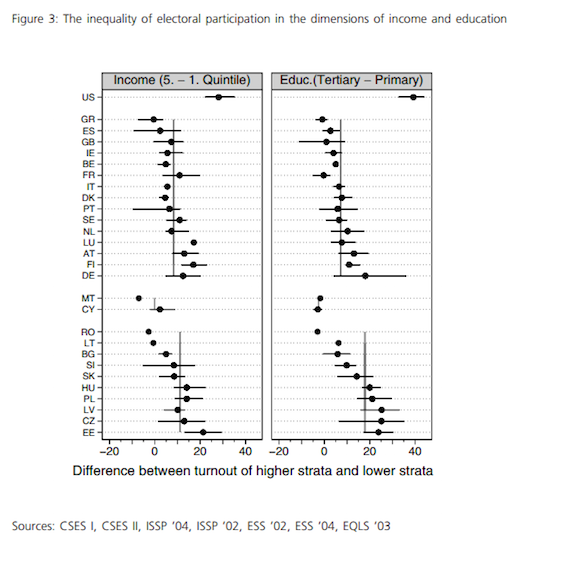 In particular, most of the quasi-experimental data from large structural turnout changes, including the enfranchisement of women around the world, or the working class in Western Europe, led to more expansive social spending, poor relief and public education.” In my recent Demos report (and earlier Demos explainer), I review the literature on turnout and policy outcomes and find that there is powerful state, national and international evidence that higher turnout leads to more representative policy and a stronger safety net. Obviously, a literature review that covers the international realm might not be able to account for our peculiarities: like complex registration systems and midterm and off-cycle elections that primarily decrease turnout among Democratic voters. Political scientist Anthony Fowler finds that by depressing turnout among marginal voters, midterm elections do favor Republicans, enough to win them seats (and gubernatorial elections). He tells Salon that “Republicans do about 1.5 percentage points better in midterm years than in presidential years. For governors, I estimated a 6 percentage point difference.” A recent working paper by leading political scientists Brian Schaffner and Stephen Ansolabehere has a similar finding using mass survey data. A recent study by political scientists Thomas Hansford and Brad Gomez helps clarify. They find that turnout modestly benefits the Democratic Party, but there are powerful compositional effects (meaning that the effect will be mediated by the partisan concentration of the district), anti-incumbent effects, mobilization effects (for a non-compulsory reform) and volatility effects (new voters are less likely to have strong partisan allegiances). All of this means that the electoral effects are incredibly hard to determine. My read on this literature is that Democrats could expect a slight boost from higher turnout, but that the other factors would also be powerful. However, turnout would certainly lead to more equitable policy and a more equitable economy. Our national conversation on turnout often focuses on the clear barriers to turnout: registration, ease of access, time availability. But as I’ve noted, there are other key concerns -- for instance, perceiving that their are large partisan gaps and perceiving that parties are close to your interests. But another important factor is whether people feel that it is in their material interest. The classic example of this feedback loop, described by political scientist Andrea L. Campbell, is Social Security. Prior to its passage, older Americans weren’t known for their engagement in politics. Since its passage, however, older Americans participate at dramatically higher rates than middle-aged and young people. Social Security created a group of beneficiaries with a stake in democratic participation to protect their benefits. Similar mobilizations have occurred around the G.I. Bill, as extensively documented by political scientist Suzanne Mettler. Cornell political scientist Jamila Michener finds that one key problem is that in many cases programs are designed in such a way as to reduce turnout. She tells Salon that, “Medicaid can be a boon for participation but on average it is actually a bust because it is too often designed and implemented in ways that alienate beneficiaries from politics (and federalism exacerbates this).” For example, political scientists Sarah K. Bruch, Myra Marx Ferree and Joe Soss find that Head Start bolsters political participation and civic engagement, while Temporary Assistance to Needy Families (TANF) depresses it. They argue that paternalistic programs like TANF decrease turnout, while participatory programs increase it. Indeed, in states with less paternalistic policy designs, the effects on turnout for TANF disappeared (this aligns with Michener’s forthcoming research). Government interactions that are negative and paternalistic reduce turnout, while positive interactions boost it. Political scientists Vesla Weaver and Amy Lerman find that interactions with the carceral state, whether incarceration or simply being stopped by a police officer, reduce civic participation. There has been a bipartisan attempt to win over donors and the ephemeral (and usually white) swing voter, rather than mobilize potential supporters. Political scientist Seth Hill finds in a working paper that, “Swing voters contribute on average 4.1 percentage points to change in party vote shares, while change in turnout influences outcomes by 8.6 points.” This suggests that mobilizing the base is a more effective strategy than trying to win over swing voters. In addition, a large literature shows that mobilization works, while the evidence suggests it’s difficult to persuade people to change their mind. One key problem is that both parties have failed to mobilize people of color, partially because of disparities in registration, but likely also because of their overwhelmingly white consultant classes. As Steven Phillips notes in "Brown Is the New White," though 46 percent of Democratic voters are people of color, nearly 97 percent of the money the Democratic party disburses goes to white consultants (83 percent white men). This has a profound effect on strategy. By making low-income people, people of color and young people a potent political force, both parties would be forced to develop policies to win their votes. The centerpiece of a more equitable and responsive democracy is automatic voter registration and voter turnout. As Larry Sabato notes, “Every election is determined by the people who show up.” And policy is decided by politicians trying to win over the people who show up.